Following the ground-breaking and critically acclaimed co-production of All My Sons in 2013, the Royal Exchange Theatre and Talawa Theatre Company once again join forces to present King Lear in association with Birmingham Repertory Theatre. Talawa Artistic Director, Michael Buffong, directs acclaimed stage and screen actor Don Warrington in one of Shakespeare’s most iconic roles. 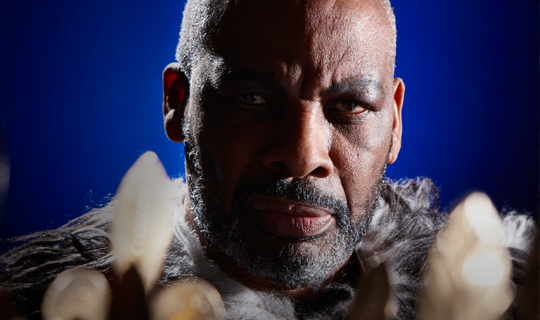 This powerful reading of King Lear is presented as part of the celebrations for Talawa’s 30th anniversary year, and 400 years after the death of Shakespeare. Talawa Theatre Company is the UK's primary Black-led theatre company. Led by Artistic Director Michael Buffong, Talawa’s work is informed by the wealth and diversity of the Black British experience. For 30 years Talawa has created outstanding work by cultivating the best in emerging and established Black artists, investing in talent, developing audiences and inspiring dialogue with and within communities across the UK and internationally to enrich the cultural life of all.